Most film transfers using default video cameras are incorrect. A gamma curve unique to the film base must be applied first. Many film to video transfer facilities do not transition the conversion of digitized film frames to video properly. What’s missing and incorrectly applied is the proper gamma adjustment to the captured film frames. Film has a very unique gamma or density distribution function, that is very much different from that embedded in many digital video cameras. The same video cameras that in many instances is used to capture film. Usually the gamma function cannot be changed within a standard video camera, thus affecting the proper image output when used for film capture. For film, uncorrected gamma curves create a harshness in the mid tones and over drives the highlights (unnecessarily hot), which in turn forces a reduced exposure setting during capture thus compromising the shadows and the overall ‘lightness’ in the resulting images. All of which risks the boogy man of video banding to appear. It is the effect of reduced or flat distribution of pixel depth, the look of missing blotchy, colours and ugly abrupt gradients. In essence, the full range of 255 possible tonal levels (if 8 bit LUT) is really made to be less or flat across a wide range of luminance values. Not a good thing to have when it can be prevented in the first stages of film digitization and capture. We at RHMG have developed a software utility (see application GUI above) that will generate LUT tables for any video application using image sensors or camera modules that allow internal LUT modification. Whether it be challenging machine vision applications or Medical imaging. We use this tool for our film transfer work which provides very good imaging output results, so that any further video based gamma adjustment for proper display purposes will be correspondingly correct. The software utility supports 4 bit to 16 bit LUT tables in 1 bit increments, with programmable breakpoints and curve or slope variants. 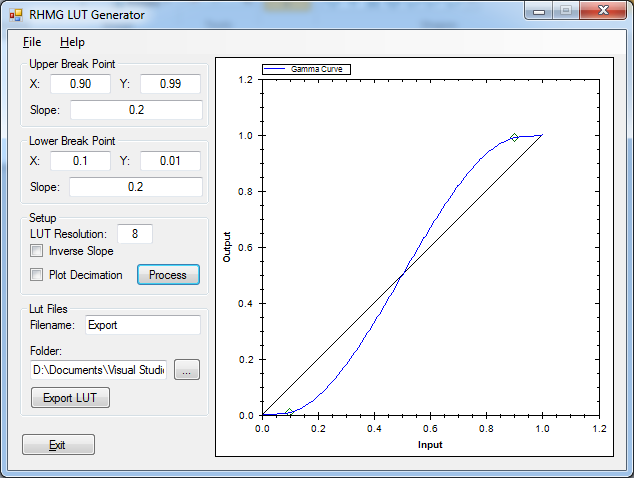 An attached plotting function will allow viewing of any experimentation before committing to a final LUT data table. Exotic spline functions ensure smooth curves even in high transition conditions. The program is Windows based (sorry MAC) and generates applicable LUT tables in a standard comma delimited text file (UNICODE) format, allowing the LUT data to be read easily by any third party development program or API tools attached to LUT ready imagers. Download your free: LUTSetup executable here. In order for this application to work, you will need to have or already installed Windows FrameWork 3.5. Win XP, Win 7 and 8 will work.